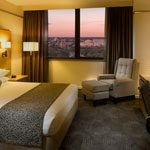 This iconic Adelaide hotel on the River Torrens connects guests with everything that’s special about the city. Culinary feasts await at two award-winning restaurants: enjoy fresh seasonal cuisine at Riverside and Japanese specialities at Shiki. 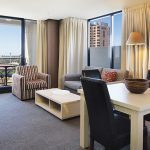 An ideal city retreat, this Adelaide hotel boasts an outdoor pool and luxurious suites with breathtaking views. 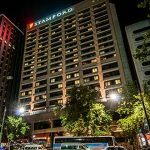 Step outside and you’re a short stroll from the cultural boulevard of North Terrace, Adelaide Festival Centre and redeveloped Adelaide Oval. 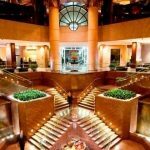 Spacious rooms offering modern design and an elegant marble bathroom with walk-in shower, separate bath and large vanity area. 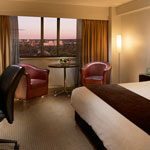 These larger than average luxury Adelaide hotel rooms are located on our high floors overlooking either Adelaide’s historic parklands or the CBD. 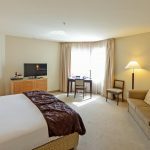 Our Superior rooms offer a selection of bedding configurations, sofa chairs and dining table, broadband internet, large work desks, excellent lighting, flat screen colour televisions, broadband internet, variety of cable channels and in-house movies. 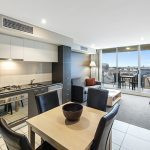 Our spacious 1 bedroom serviced apartments offer full hotel services and are a popular choice for singles, groups and families seeking great-value Adelaide CBD accommodation for leisure or business. 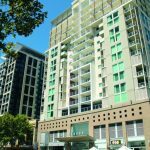 All apartments are fully self-contained with kitchen and laundry facilities and boast contemporary furnishings, cable TV, internet access (including 30 minutes continuous use of free internet per day), direct dial telephones, writing desks and individually controlled reverse cycle air conditioning. The 1 Bedroom Executive Apartments also feature the added luxury of an in-room spa bath. 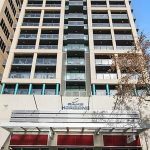 The perfect base for business or leisure travellers seeking self-contained apartment accommodation in Adelaide, Oaks Horizons offers a range of modern 1 bedroom apartments with fully-equipped kitchen and laundry facilities, a private balcony with city views, writing desk, cable TV, broadband internet access (including 30 minutes of continuous use free per day), air-conditioning and an in-room safe.